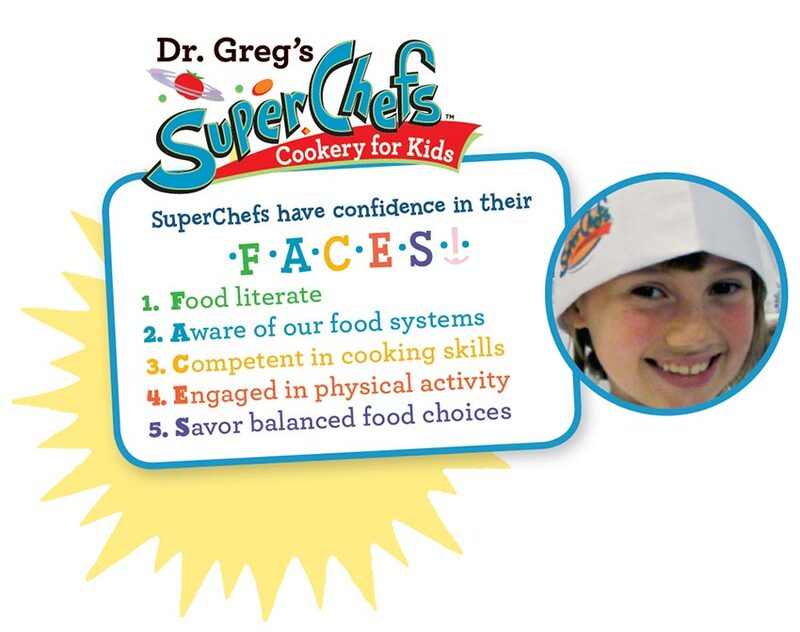 SuperChefs is an entertainment lifestyle private company which has a non-profit arm called Dr. Greg's SuperChefs Cookery for Kids, headquartered in Vancouver, British Columbia and Manhattan New York. SuperChefs is guided by international experts in the healthcare, culinary, entertainment and academic world to improve the health and wellbeing of children worldwide, Our pillars help children put on their best FACES: Food literacy, Aware of their food systems, Competent in cooking skills, Engaged in physical activity and Savour balanced food choices. SuperChefs founder is Dr. Greg Chang, a dentist/chef/clown that uses food to connect the dots between oral health and overall wellness. SuperChefs Entertainment Inc. owns the SuperChefs brands, including The Super Chefs of the Universe, a program designed for younger children aged 4-8 years with a ‘super hero' theme. The SuperChefs, Mira, Spicer, Coco, Potpan, Wrapper and Mixer try to save kids from the evil Deep Fry and his gang of fast food fiends. Dr. Greg's SuperChefs Cookery for Kids program is a hands on cooking program designed for kids 8-12 years where “Kids get Cookin'”. These non-profit programs run in schools, community centres, resorts, summer camps and culinary events across North America. SuperChefs has partnered with local (Surrey School District, University of British Columbia), National (International Association for Culinary Professionals, Canadian Dental Association), and Global Partners (Westin Hotels and Resorts- Kids Eat Well Program) to make an impact on kids' health all over the world. The SuperChefs Cookery empowers children in the battle against childhood obesity by teaching the essentials of balanced nutrition, food preparation, and social etiquette toward inspiring lifelong habits of physical and social well-being. Under the direction of world class professional chefs and educators, students learn in an enriched setting focussed upon the joy of cooking while engaging in a residential program featuring team-building, athletic and artistic pursuits. SuperChefs Have Confidence in Their FACES. SuperChefs is guided by international experts in the healthcare, culinary, entertainment and academic world to improve the health and wellbeing of children worldwide, Our pillars help children put on their best FACES: Food literacy, Aware of their food systems, Competent in cooking skills, Engaged in physical activity and Savour balanced food choices.